Our travel writer, Rachel DiMattia, talks about how to tame your tresses whilst you are on the move. If you are anything like me, you are a woman with A LOT of hair. I think this is a common blessing and curse when you are far from home. For one, long hair can be a pain to deal with. I am constantly trying to move it out of my face, tie it back, and brush it to keep it looking nice. Long, thick hair requires a lot of maintenance. I feel the need to buy fancy shampoo, conditioner, and hair products to keep it looking good. As a poor traveler, this can be difficult, especially because many of these products are expensive to buy as well as heavy and bulky in my backpack. Do not even get me started on blow dryers, straighteners, and curling irons! They are impossible for me to bother with anymore. When I first started traveling long-term, I would buy a new blow dryer in the country that I would be spending the most time in. Blow dryers are not usually too expensive, but they are bulky, even when you buy the little ones. If you are staying in shared accommodation, they are loud which can be rude, and using them is really time-consuming. Because of this, I completely gave up on blow-drying my hair. For the past year, I just put some anti-frizz cream in my hair after washing it and let it do its own thing. As for straighteners and curling irons, I do not use them anymore, either. I never used to leave my house without having my hair at least partially blow-dried and straightened or curled, but now I am a whole new me. Eventually, it seemed as though my hair preferred being left alone, and now I like it the way it naturally is. I have mostly straight hair, though, so I can imagine that could be difficult for curly-haired women. Now, onto getting a haircut abroad. Many people have a certain hairdresser that they go to for the specific hairstyle that they like. I completely understand this, because once you trust a person with something as special as your hair, you want to keep going back to them. However, when you are traveling long-term and your hair starts to grow out of control, you have to solve the issue; that means getting your hair done by a stranger. This can be really costly, and many people believe that if you pay more, you get a better haircut. This is probably true, but I am a cheap backpacker, so I am not willing to pay a lot for haircuts. Instead, what I do is find a hair school to go to. 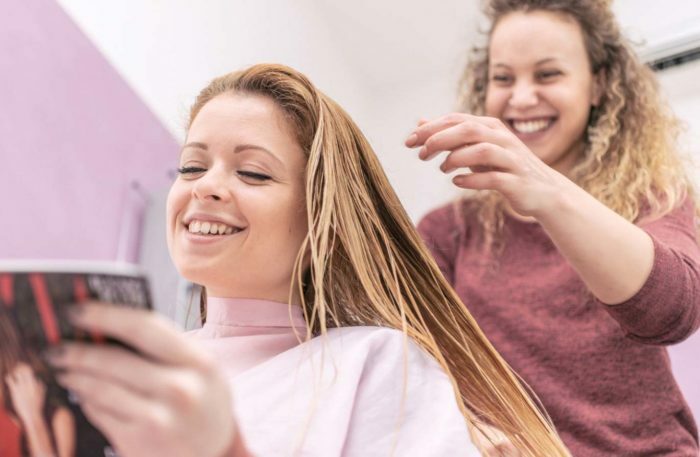 I have surprisingly have had great luck with this and here is why: for one, it is ridiculously cheap, and for another, hair cutting students usually have a teacher that needs to approve the haircut before the customer is allowed to leave. In that case, you are getting not one, but two sets of eyes on your haircut before you start walking around with it. To me, that is more reassuring than going to a mystery hair salon, paying a lot of money, and trusting that your cut will turn out nice. With my hair, I usually just get a trim, so I think that is why I am so brave with getting my hair done. Hair school is something that I do recommend trying, though. So when you are traveling, keep it simple. Let your hair run wild and free. You may end up liking it and never go back to using all that heat on your head that’s bad for it anyway. And hey, maybe you’ll start going to a cheaper hair dresser at home, too! Next articleMalala Yousafzai- Where Courage Dwells!